Whilst Plyo Box movement’s good, the landing’s are less so. If you’re using a hard box, the impact going up through your feet, ankles, knees, hips and lower back is significant. And if you miss your footing, hard sides, corners and edges can hurt like hell! That’s why we’ve focussed on the landing as well as the motion of jumping with the Sync Box. 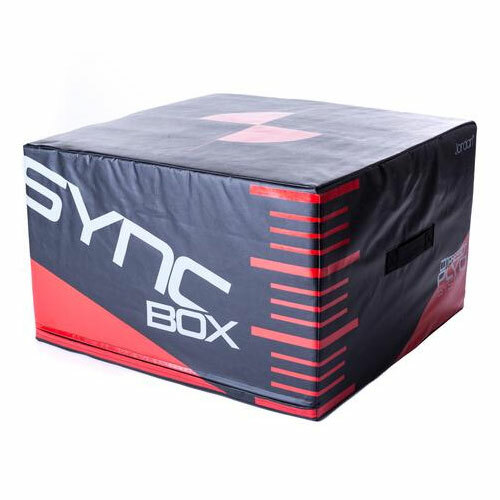 The Sync Box’s strong, sturdy platform is covered in soft but hard-wearing, impact absorbing and non-slip materials. So the sides, corners and edges are all forgiving to prevent bumps and bruises. In fact, the real fitness magic is in this impact absorbing cover. It minimises the shock to your joints and maximises the benefits to your core, forcing your muscles to adapt quickly while improving your balance. It’s fantastic for rehab, especially effective in sports injury rehabilitation. The Sync Box. You’ll find it’s a hit, even if you miss your footing. So jump right in.